French painter, printmaker and designer. He first trained with Pierre Lacour the Elder (1745-1814) in Bordeaux and on going to Paris studied with Franois Andr Vincent and then Jacques-Louis David. While a pupil of David, he became friendly with both Franois-Marius Granet and Jean-Auguste-Dominique Ingres. 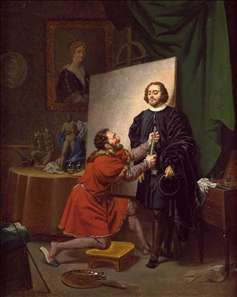 From Bergeret s earliest Salon exhibit of 1806, Homage Offered to Raphael After His Death which was acquired by Napoleon for Josephine s painting gallery at Malmaison, he specialized in the popular historical genre of lives of the artists. Just as the Bourbons and their sympathizers appreciated historical genre paintings of their illustrious ancestors, artists of the time sought to identify with historical precdents. Anecdotes from the Renaissance, when artists enjoyed social prominence and a supportive system of patronage, were particularly popular. Among his many pictures devoted to this subject matter were Francis I in Titian s Studio, 1807 (le Puy-en-Velay, Muse Crozatier), and Charles V in Titian s Studio, 1808 (Bordeaux, Muse des Beaux-Arts). Bergeret clearly researched the historical details of these works, including the artworks and furnishings, the costume, and physiognomies. Bergeret played a major role in introducing lithography into France, with prints after Poussin and Raphael: his lithograph Mercury (1804), after Raphael s fresco in the Villa Farnesina, Rome, was one of the earliest examples of the technique. He also contributed greatly to Napoleonic propaganda by designing medals, extravagant pieces of Sèvres porcelain and, most important, the decoration of the Vendôme Column (1806-11; Paris, Place Vendôme) to satisfy Napoleon s desire for a copy in Paris of Trajan s Column in Rome. Bergeret was responsible for designing the bas-reliefs on the Vendôme Column, which record the campaigns of 1805 and 1806 (Austerlitz) in the way that those on Trajan s Column record the Dacian Wars. It was destroyed in 1814, replaced in 1833 and again in 1863, before being demolished by the Communards in 1871. It was restored in 1875. See more details about "Aretino in the Studio of Tintoretto"